In a just released video HRC Team Director Katsumi Yamazaki describes Honda’s Dakar weapon, the CRF450 Rally. Warning: Yamazaki-san’s monotone delivery manages to snuff the excitement factor of what is an incredibly trick motorcycle, but it’s still interesting to watch. Honda returned to the Dakar Rally for the first time in 24 years in January 2013. The 2013 CRF450 Rally prototype provided Honda valuable information on key areas such as engine power, aerodynamic performance, durability and maintenance requirements, used as a basis for further design modifications and improvements. 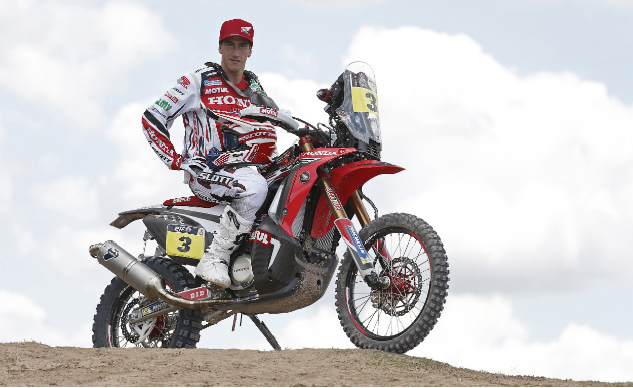 Paulo Gonçalves won the 2013 FIM Cross-Country Rallies World Championship aboard the Honda CRF450 Rally, while Team HRC also achieved victory in the Merzouga Rally last October. 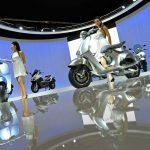 The new model has a completely new engine, new chassis, new swing arm, plastics and three different petrol tanks with a total capacity of 35 litres. The power is increased and the overall weight is decreased in order to offer better and easier handling. 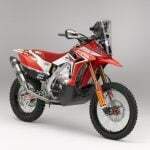 The new model also retains the electronic Fuel Injection (PGM-FI ), system that has shown proven performance in the harsh and highly variable environmental conditions of the Dakar Rally. 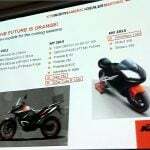 The new CRF450 RALLY will be used by the HRC riders in Dakar 2014 and will be available to other teams for motorcycle rallies later in 2014.